The Al-Saud dynasty gave its family name to the Gulf Arab monarchy of Saudi Arabia ruled by the sons of founder Abdul Aziz bin Saud. The Al-Sauds trace their origins to the 1700s, when Saud bin Mohammad reigned as a local sheikh in the central Arabian peninsula, the birthplace two centuries later of the only country in the world named after a family. His son Mohammad allied himself in 1744 with a fiery cleric, Mohammad bin Abdul Wahhab, who advocated a return to purist Islam, spreading the doctrine through the might of the sword. Mohammad's descendants lost control to Ottoman forces in 1818, but six years later the Saud family retook the desert seat of Riyadh only to squabble over the succession. By 1902, Abdul Aziz bin Saud expelled the rival Rashidi clan from Riyadh, at the heart of the peninsula, and set about consolidating his power. Abdul Aziz unified the territories in a series of tribal wars. He took control of the Gulf coast in 1913, expelled Hussein, the Hashemite sharif of Islam's holy city of Mecca, by 1925, and in 1932 declared himself king of Saudi Arabia. To strengthen his authority, the new king took in marriage the daughters of tribal chiefs. Today, the ruling family totals up to an estimated 25,000 members, including some 200 influential princes. Oil was struck in 1938 in the strictly conservative Wahhabi kingdom, transforming it into one of the world's richest countries. Abdul Aziz had 45 recorded sons. King Saud succeeded the kingdom's founder on his death on November 9, 1953. Faisal took over on November 2, 1964 after his half-brother was deposed on charges of corruption and incompetence. Saud died in exile in 1969. The architect of Saudi Arabia's modernisation, Faisal was assassinated by a nephew in March 1975. The assassin was said to be mentally disturbed. Khaled, another half-brother, took over and ruled until his death in 1982, when Fahd became king, appointing Abdullah, two years his junior, as crown prince. Abdullah ran the day-to-day affairs of state after Fahd suffered a stroke in November 1995. 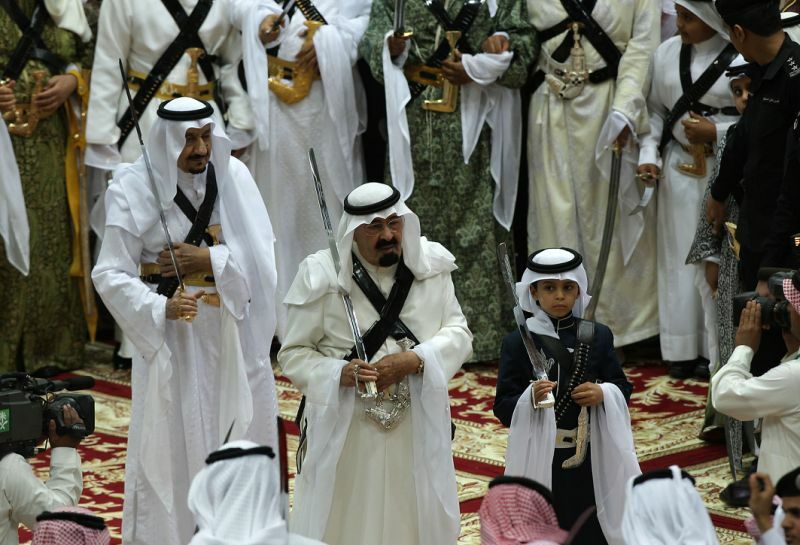 The popular prince acceded to the throne automatically following the death of his half-brother, despite a 1992 law passed by Fahd which opened the succession to Abdul Aziz's grandsons and not just his sons. Salman rose to the throne in January 2015, becoming the last of the bloc of brothers known as the Sudairi Seven, after their mother Hassa bint Ahmed al-Sudairi, to rule.